This is the success stories page where I collect whatever people send to me. The pictures has been shrunken but they’re clickable to get the original size. First of all: I like your site. 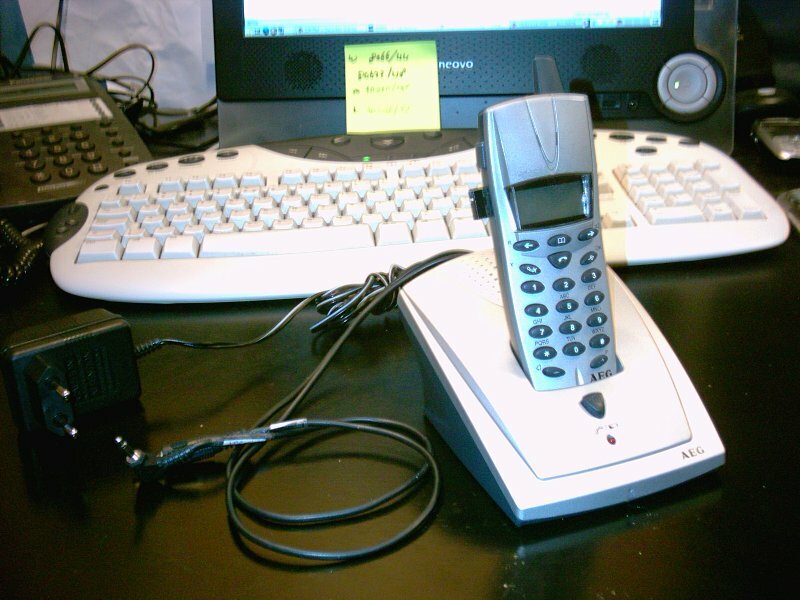 I’m always looking for projects to do during the evening and when I looked at the success stories about modded phones (for VoIP use) it came to my mind that I also had a few (cordless) phones liying around. 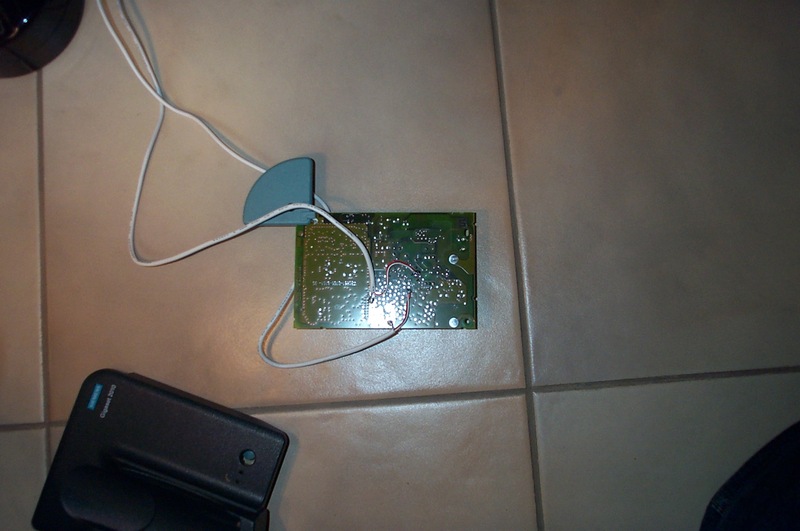 After studying the datasheet, I connected two cables to this chip. 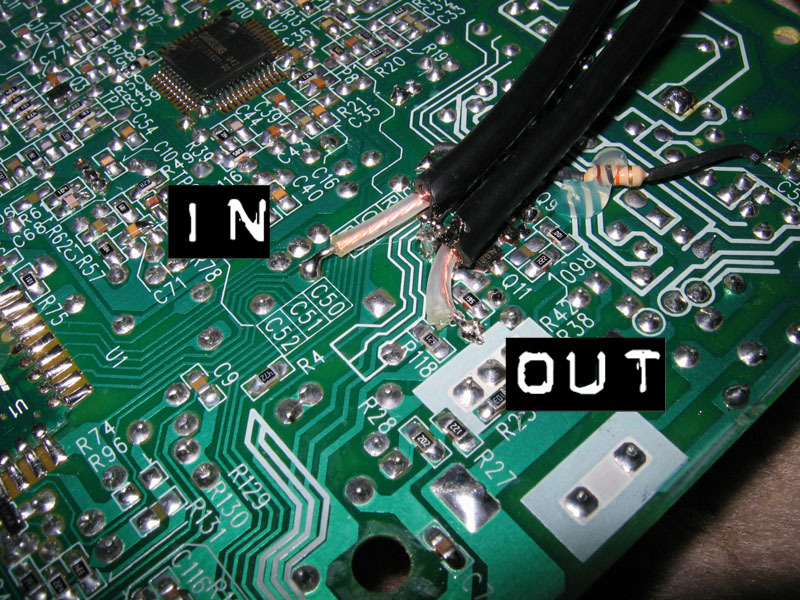 One to the Mic+ pin (this is the cable where the sound of the microphone inside the phone comes out) and the other one to the QR pin (which is the output pin of this chip that connects to the speaker inside the handset). It looks like AEG has used the reference design by Philips almost completely. With this connected to a computer I can call over the internet using this phone. There are only a few bugs I would like to solve. First of all the person on the other side keeps hearing his/herself over the phone. This is not easy to solve. This problem is probably caused somewhere inside the handset. The other bug is that the USB sound adapter I use gets very hot while using this set. Probably caused because the TEA1110 is able to drive a earpiece without an amplifier. 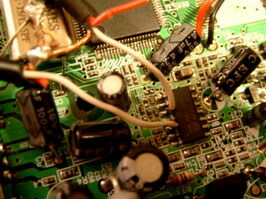 Therefore the output stage of the sound card draws a lot of current to drive the speaker. I’m probably able to solve it by disconnecting the output pin of the TEA1110 (haven’t done this yet because lack of time). Some pictures of the mod are included with this email. I used pretty much the same method on this phone so ill only include the Final result. This is an Uniden model EXP970bought in walmart for a few bucks using the ilustrated connections. I get really good sound quality. Verry little “hizz”. I used this guide to convert my spare Uniden “Extend-a-phone”. Works a treat, but i may have to put another sound card (i have plenty anyway) into my MCE box, so the TV can continue to run while talking on the phone. I was able to solder on the “Links” on the top side of the board. Back to chatting on skype! Internet telephony with Skype, Skype, provider, chatcord, VoIP,Voice over IP, save, new, cordless, Free phone calls, chat-cord, IP Phone, Skype compatible, free voip, dualphone. Hi, i’m Mike, 20 years old from California, and i somehow found your site about the skype phone, since im into electronics and havnt had a good progect for a while ..and had an old phone, i desided to try it…and it worked, its not the same phone its a ge, the hardest part was finding the line out contact, i must have spent a good 2 hours looking for it, lol, very fun project thuogh and useful too, people are going to see that and be like WHAT????? lol then i tell them what it is and theyre like…wow thats cool, so thanks for putting that on a website, i can give you some pictures too, maybe you could put them on there too..like "Another successful Skype phone" or something like that, that would be cool. As in the original article described, I did use a screwdriver to find the line-in on the telephone. It’s just a matter of testing all places and listening in the handset to see if you here any clicks. The line-out I found by using a pair of old earplugs. 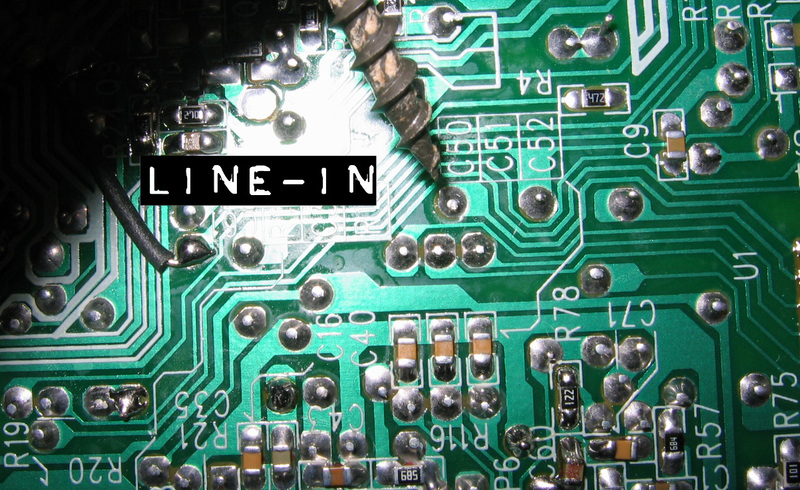 One wire on the ground of the circuit board, and using the other as probe. I found it by blowing in the handset microphone and testing all places. I enabled the onboard-audio on my motherboard and then connected my phone there, so that I can keep on using my regular soundcard for the house/garden/windows and work. Feel free to post it on your site/messageboard. 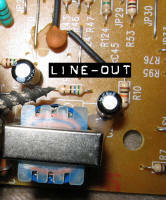 Connect the line out wire on the back as shown above. I send you some pictures of the Gigaset 2010 circuit board with the wires connected. Sorry for the bad quality of the images, but my camera isn’t very good in doing close ups… I hope you can at least get an idea of where the connection points are located! They both consist of one normal sized soldering joint and a smaller one close to it. I connected the grounding to the large plate on the side of the board – but be aware if there is enough space for the cables around – I had some problems getting the board back into the case! At http://www.chatcord.com/ you can download special software (ChatCord Dialer, Chat-Cord@DialerSK_v2.0.0_Setup.zip) to use the dialpad of your phone. However after the setup the software refuses to work because it expects the ‘Chat-Cord’ product. The ChatCord is a piece of hardware between your soundcard and your phone (see their website). It interfaces through the audio-in and audio-out. There is also a USB plug, but that’s only for powering some phone. The ChatCord dialer software sends two tones to the phones an I think it expects some tones back. I’m further investigating it…. To ‘none of yer bees wax’ – you may want to check your own “terible” spelling. I do “know” not “no” how to spell. Cool, ga binnenkort ook eens een keer zoiets maken. none of yer bees wax was having her period and the thing got stuck, so forgive her. ing the wrong numbers!? Have someone a good ideaÂ´ how to get it to work? Hi, I love the idea of this project. I was wondering if it was possible to accomplish the same thing using a cut phone cord. I have done this before on accident but was unable to reproduce it today. Maybe someone areound here knows about phone networks? I was thinking that, like, if I take a headset cord and splice on an rca connector and plug it into my TV, only 1 wire has to be connected in order for the audio to play. Could we acomplish something similar with a cordless phone? I know that in a phone network, one wire carries sound in and the other out, but I just don’t know what would be needed to get that into form sufficent for use as a computer speaker/microphone. Chris: Hmm, I think you’ve got this a bit wrong about what goes in the cables by the telephone network. The two middle one’s (one pair) are carrying the incoming signal to the telephone and the outer pair are carrying the signal to the next telephone in your house. If you look at the middle pair then they actually contain voice in, voice out and power. There is no way on connecting that cable directly to a headset or a tv without almost certanly wrecking everything in a couple of minutes. One way to do this is to build a chat-cord but that only works outside the telephone network as it is actually building an isolated telephone network. The best solution is to look at this page, and look under “Other transformer isolated interfaces”. It contains everything you need to connect virtually anything to the telephone network. I’ve build this one myself and it works great. Should only cost a few dollars to construct on even a cardboard base, toss it into a box and viola! instant conversion for old phone (POTS) to PC. 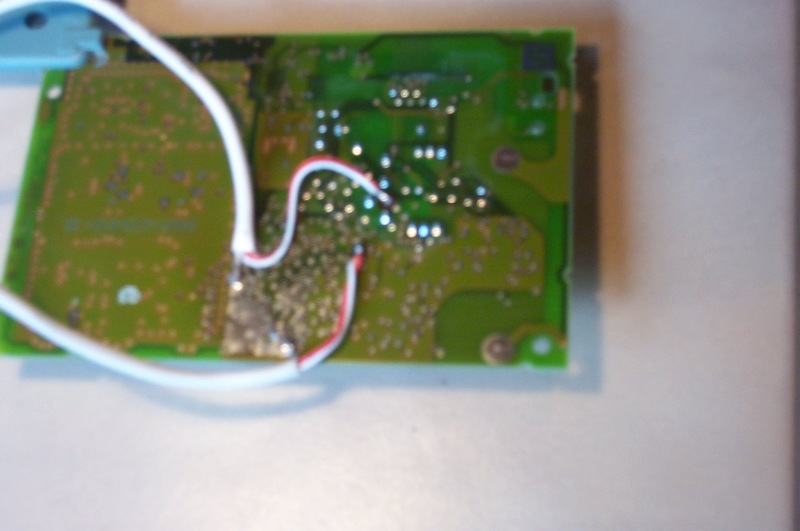 Saves pulling the phone apart and soldering onto minature bits. 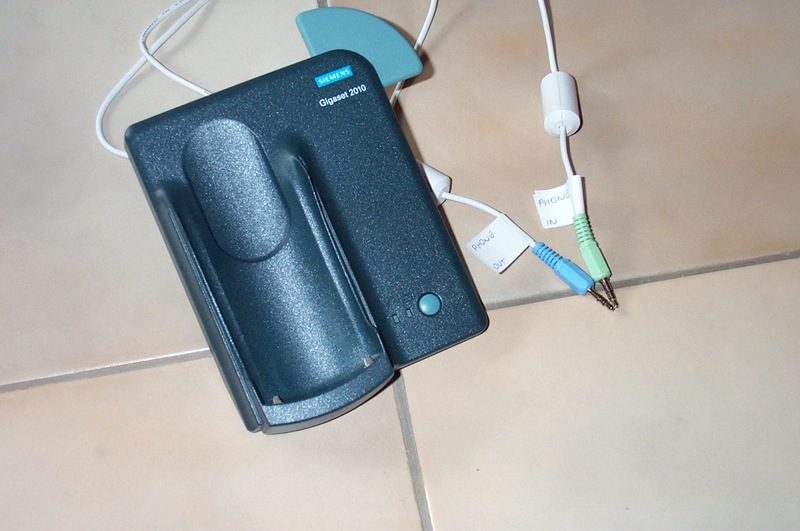 I’ve the siemens Gigaset A100 and I attempt to do the proposed modifications for use in Skype. But, I don’t arrive to open the black box under the circuit is logged!!!. Could you help me? What is the thing/astuce to open the box without break it? Can you email-me at trotam@inicia.es? Thanks. I’m sorry for my bad English!!!. I love your project. Can you, pse, be more explicit in the schematic? Ocix: As far as I can see KegRaiders schematic is similar to the one in the chat-cord. trotam: I’ve dropped Winfred an email about your problem and we’ll see if he can help you. I’ve succesfully moded a “Famitel S” (A white Siemens Gigaset 3010 distributed by the spanish phone company under another name). As i use it with a laptop, output signal is high for the mic input, so i do a simple 10dB atenuator pad using a 10k and 1k resistors. Also i’ve do a mod to make it work with dialer-sk, the problem with internal mod and dialer-sk is that the phone refuses to send dtmf tones if it isn’t attached to a phone line, so i’ve studied the pcb and found the point where dc goes (after phone ac rectifier and atenuator) to the main cpu. 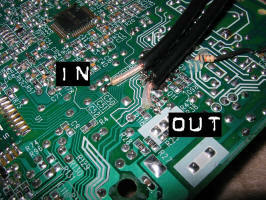 U only have to put a 10k resistor from vcc (+3.3v) to that point to make the cpu think there is a phone line attached. It works great, thanks for the idea!!! I’ll send photos as soon as possible. I write regarding your flame to another user (please see attached below). If you’re going to comment and correct the English in a different post, at least try and get your own post right. Terrible is spelt with two ‘r’s. Your use of ‘no’ is incorrect as you are talking about their knowledge; ‘know’ would have been the correct usage. As for your grammar… I can only hope that you’ll be joining your hapless victim in taking an English class. Do you think that this will also work with a Gigaset A120? Iâ€™ve also tried locating the ring detector circuit on it too, but no luck with that yet. It would be a killer to have it ringing as well on incoming Skype calls. Anybody who has overcomed this challenge? 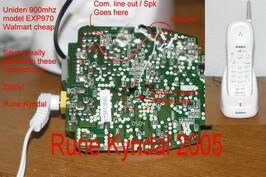 Has anyone gotten the Uniden model EXP970 to work following Rune Kyndal’s instructions? I am able to get the line out but unable to get the line in to work. Can anyone help me out? Thanks! I’ll be interested to see how your mod works out. A picture or two would be nice… Thanks! – If I build this chat-cord will my (wireless)phone ring if someone calls me on skype? – Can I just pick up the phone, dail a number (must that be a special skype number?) and will i be connected? – If I have some music running what will do, will it interfere? I have audio-connections at the front of my PC and at the back, they are connected to one sound-card, I would connect the phone to the same speaker as the music. – When rang, will I just pick up the phone like an ordinary call? I really like the sound of this project, but it’s focus is a lot to on what telephones it works and irrelevant language crap. if i send you one photo of the board would you help me to find the points to hook the cables? but only one is working. Trying the same over here with a profoon DTX-721. However, I can’t find where to put the wires from the 3.5 plug. 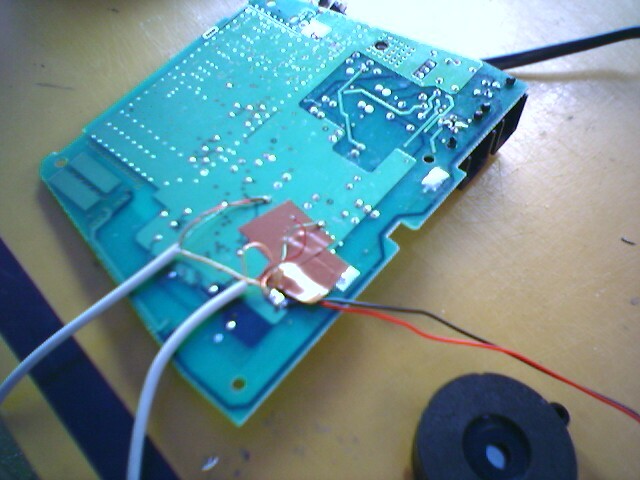 but found out that I had to use the top of the wire instead of a piece on the stripped part of the wire to ged sound. Does anyone know where to connect my wires on the circuit?? I’ve done a mod of an AEG phone. Emailed it to the site admin. With this phone I have the problem that the output stage of the soundcard draws a lot of current because the output stage of the amp inside the phone. Doesn’t anybody have this problem too (I think so, because almost everybody just connects the cables to the computer to some points on the circuit board). Anyway, it looks like DECT phones are very useful for this because there is a full-duplex connection between the handset and the base station. Sound quality is rather good. I could also use it for playing music wirelessly. Rudy: Thanks for the pictures!! I’ve posted your text and pictures on this page so that everyone can see how you did it. Right now I’m playing with a Loewe alphaTel 3100 with some electronic problems.. 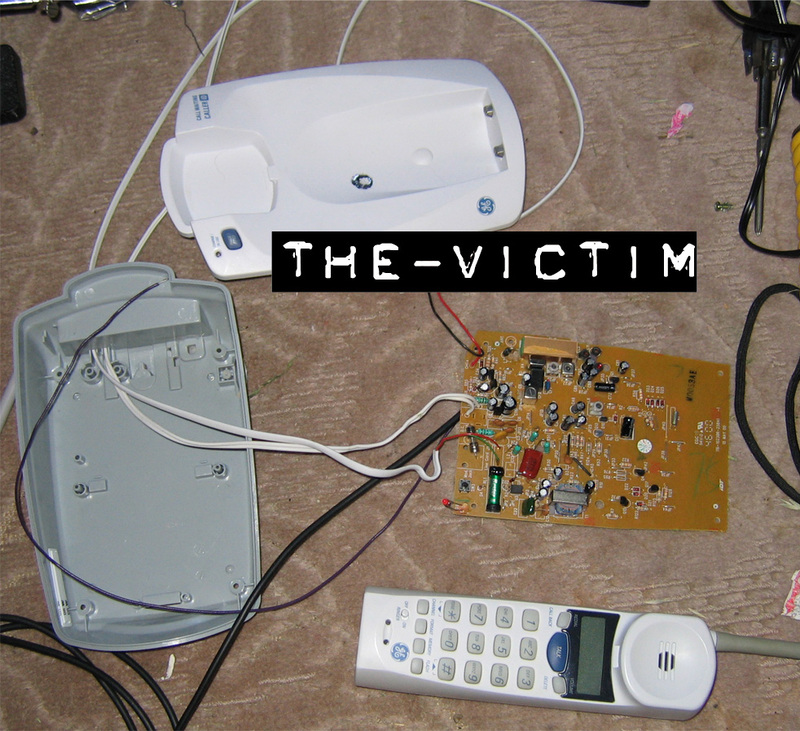 It looks like a perfect victim (only if it would just charge and switch on). Lots of opamps in it, so it probably is pretty mod-able. 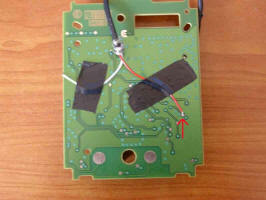 Yesterday I continued searching for the problem regarding the sound chip which was getting hot. I discovered that the problem wasn’t in the phone, but it was in the sound adapter. 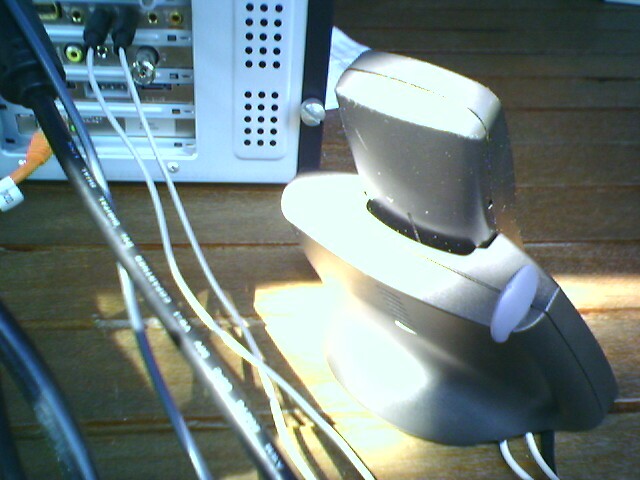 Normally all ground cables of the connectors are connected together internally. This wasn’t the case with this thing. 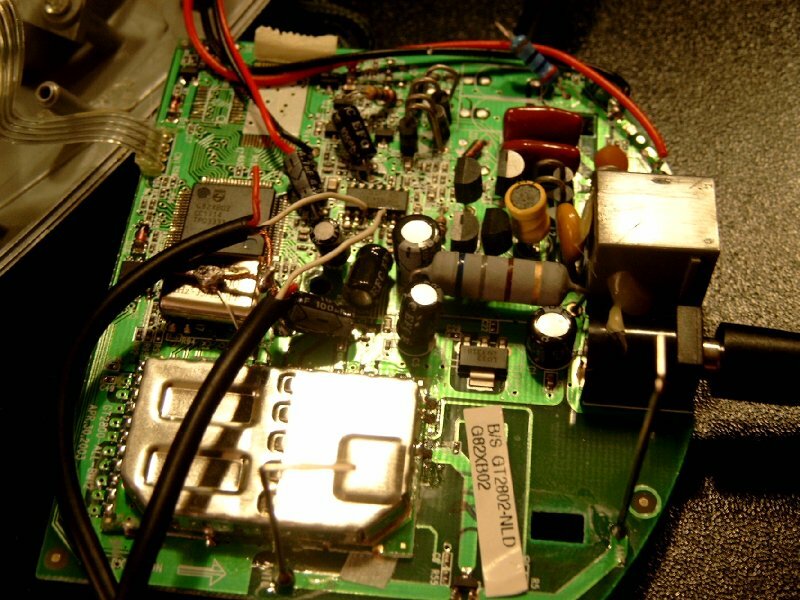 There was a 2,5volts difference between the ground of the sound output and the microphone input. Disconnecting the ground wire of the microphone solved the problem. Looks like I’ll have to figure somethin out for the amount of distortion I get with this sound adapter. It works fine with my laptop and my soundblaster live :). if anybody would be so kind / generous to help me out or knows of a place to get detailed specs on the gigaset 3000 series, id be most grateful. 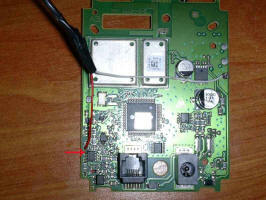 I’ve successfully done this mod also on a famitel S (spanish telefonica badged siemens gigaset 3010). and attaching a resistor to vcc (+3.3v)??? was just beyond me!!! I taped the battery to the Famitel base. 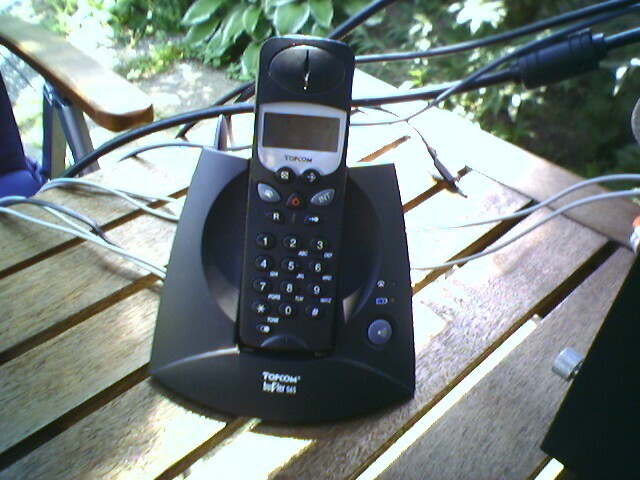 Now it “thinks” it is connected to a real phone line and sends the DTMF tones – so it successfully works with the dialler-SK software and I can start a call, dial and end a call all fromthe garden without needing to go near my pc! Getting the phone to ring with inbound calls would be nice – that’ll be my next attempt…but, meantime, I only use VOIP for outgoing anyway so not so bothered. Hope this comes in handy for someone…would post pics of the process and end result if I knew how? 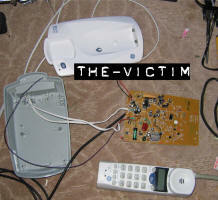 Some time ago I continued to solve the problems that I had with my phone. The echo effect persons on the other side of the line complained of is solved. This was because I kept putting too much sound in the internal amplifier of the phone. Therefore there was some feedback somewhere in the circuit and the sound was rerouted back into the microphone input of the sound card. Lowering the volume solved the problem. The USB sound adapter was getting very hot. Therefore I started measuring why this happened. I discovered that it wasn’t the output stage of the amplifier which was getting hot, but it was the voltage regulator of the output stage. This thing has a very simple class A amp I think and therefore the ground is lifted by 2,5volts. Normally you won’t get problems with it, because it is designed to drive headphones. But because I’m connecting the grounds together there was a short-circuit. What I did was actually very simple. 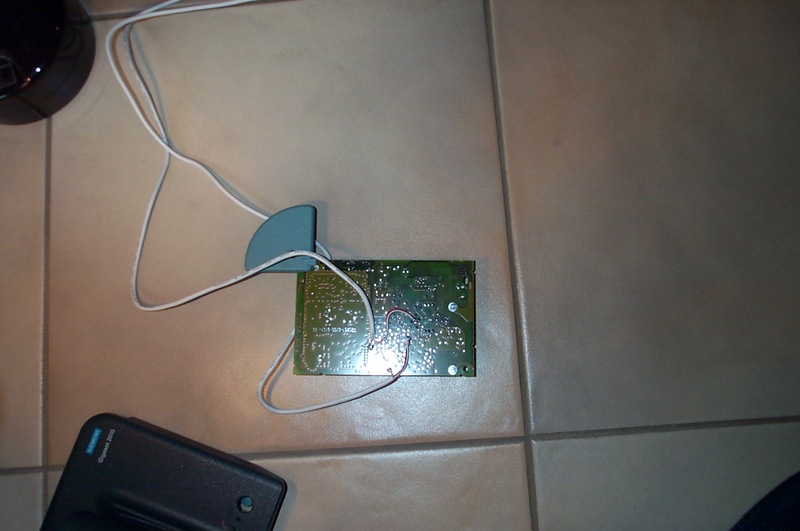 I connected the ground of the microphone input to the ground of the phone and connected a capacitor in series with the audio output (to prevent the 2,5VDC from entering the output stage of the phone). This works very well. It even works so good that I disassembled the USB casing of the sound adapter and put it inside the base staition of the phone. 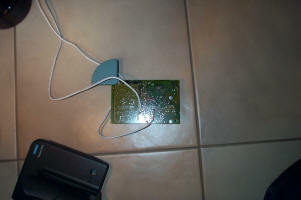 Now the phone has an USB connector and is easily plugged in the computer (USB 2.0 recommended). I don’t know how to read Keg Raider’s schematic? Can somebody send me Chat-cord dialer software. I do have 1, but it got expired recently. Does anyone have the chat-cord dialer? I bought 2 chat-cords but no software was included and the website doesn’t support the software anymore. Can anyone help please? Thank you. This is greate idea if software like skype would process beep tone signal from touch pad and map such signal into commands (like pressing answer button). But as I know there is no solution for it. It’d be nice if you could hook a phone into a modem and have it interface your computer from there. Anyone a software developer? A link to the chat cord dialer software would be appreciated. I have gone ’round and ’round in circles on the net trying to find it. They shouldn’t promote it as being able to dial from a phone if they can’t supply the dialer software for it. Yep, searched the web for weeks and can’t find chat-cord software that works. I get the latest installed and it tells me that the ‘trial period has expired- go to http://www.chat-cord.com for more information”- of course, there is none anymore. Is there a solution to this??? I built the gadget to make the cordless phone work, but with no software, it’s kinda pointless. Please email jspillers@ sbcgl0bal.net if anyone can help! Thanks! Hi, I’ve modified an old SONY SPP-58. It was quite easy to find the input and output of the circuit. 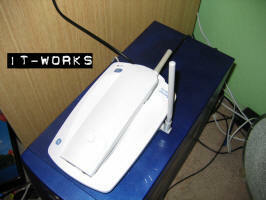 (input and output), as it is needed on a Skype phone, I get a sound similar to a dial-up modem. to the output. Any ideas? i have a panasonic 2.4GHz gigarange. i have found the input for the speaker on the handset. i can hear people fine but i cant talk. i cannit find the mic in. and help please email me. i need help as soon as possible. 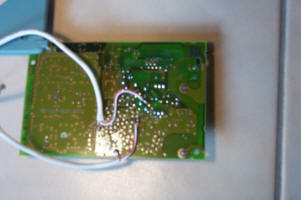 There is another way into cordless SKYPE phones which involves a lot less soldering, and gives you a DUALPhone capable of either VOIP or standard land-line calls. – a pair of cordless phones capable of making handset to handset calls. – a single cordless phone with basestation to handset call capability. – two wires with 3.5mm jacks on the end for your PC’s sound. The making process is much the same whether you’ve got two handsets or handset and base station. In both cases what you’re doing is replacing one speaker and mic with your wires with 3.5mm jacks. So either crack open the base station or one of the cordless handsets. Solder in your new wires to the Phone-Mic and Phone-Speaker. 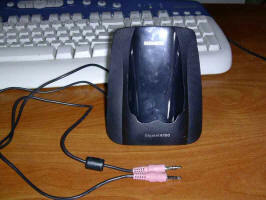 Plug Phone-Mic into PC-Speaker and Phone-Speaker into PC-Mic. If you’ve used a base-station for this you can still plug it into the usual landline socket in the usual way. You’re now ready to play, and the rest will depend slightly one what you’ve used. Basically you’re going to call the other handset using your home-made set-up, by dialing the handset’s number, or pushing the call button – it’ll depend on the make and model. Now answer this “call” using the other un-modified handset, and start whatever VOIP app you’re using. You’re PC now thinks of this as a normal audio-in/out set up, and when you use your VOIP the un-modded handset works just like any other. And the great thing is, the unmodded handset also works perfectly well calling the base-station and out on a standard landline. With mine I also have it that I can switch between incoming land-line and in/out Voip, and even set up a three way conversation between land-line, me and VOIP; great for my non-PC owning parents who can ring me on local-rate landline, and I can connect them to my uncles who lives in Australia via Skype. Hi, I need a software like chat-chord to connect the PSTN phone to the skyoe and I use Windows Millenium. Kindly e-mail me at nidhi832hotmail.com if anyone of you knws about one. Weird problem. 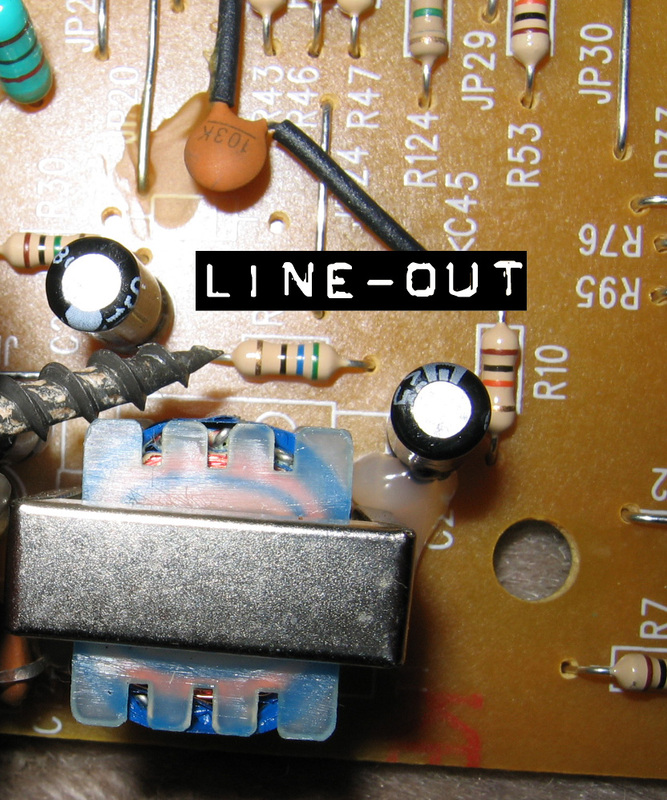 I tried to mod uniden bt-446, and I thought I found the line in and line out. I soldered and hooked it up, but I only get one source at a time! I have to get mic working and vice versa. it seems like the part I found is where both in and out meet, but I can’t get it seperately… can anyone help? oh, by the way, I also tried modding the phone cable itself as posted above, and no success. There was no sound out of the speaker unless I pulled the mic cable half way out of the laptop. I couldn’t get the mic working, well, bearly. Oh, I’m sorry I thought this was a techical aid webste..